One of the best lifestyle spots in NZ! We’re seeking a Consultant Old Age Psychiatrist (Psychogeriatrician) for an expanding team based in Tauranga, one of NZ's fastest growing cities. You will have broad experience and skills across Psychiatry of Older people, along with a sound understanding of contemporary models of care; proven leadership skills and experience working in a multidisciplinary team environment; an interest in medical education and teaching; and a commitment and willingness to be involved in continuous quality improvement programmes. The Mental Health Service for Older People comprises a 10 bed inpatient unit, a multi-disciplinary community team that provides assessment and case management, and the integrated Community Outreach Service which provides individual and group therapies. The Service covers the whole Bay of Plenty region, so some clinical time in Whakatane may be required. On-call duties are based in Tauranga, with Whakatane having a separate adult mental health service that will assess MHSOP crises. The wider Mental Health & Addiction Service includes General Adult Inpatient and outpatient services, Psychogeriatrics, Consult Liaison, Child and Adolescent, Drug and Alcohol and Maternal Mental Health services. There are opportunities for research and teaching with the Bay of Plenty District Health Board’s own Clinical School as well as the close links with University of Auckland. They are an accredited site for Psychiatry Registrars training through the Upper Central North Island (UCNI) training scheme and 5th and 6th year medical students through the University of Auckland. Tauranga is now the 5th largest city in New Zealand with an urban population of 170,000 (regionally 220,000) and is only a short drive south of Auckland. 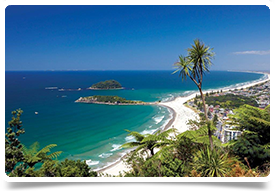 It has always been a premier destination, but with a strong NZ economy and a very buoyant housing market with many beach frontage properties and luxury apartments, Tauranga is now the fastest growing city in New Zealand. The schooling options are excellent, with both high performing public and private schools available. Tauranga - and in particular the suburb of Mount Maunganui - is well known across NZ for many things; the relaxed lifestyle, the sunshine, the café scene, the surfing, the white sandy beaches and natural salt water hotpools, and the safe and family-friendly lifestyle and luxury real estate. It attracts families of all ages into the area and is a holiday favourite for visitors. Alternatively, if not NZ trained or based, you will hold equivalent specialist qualifications, e.g. MRCPsych & CCT, which are eligible for Provisional Vocational registration (long term) or Locum Tenens registration (short term up to 12 months). These are the specialist pathways for medical registration in NZ as a Psychiatrist.